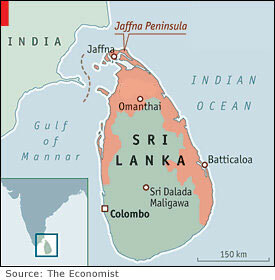 Three decades of civil war in Sri Lanka ended in May 2009, however the underlying conflict that resulted in that brutal war continues. True peace is more than an end to the active fighting of war. Fundamental democratic principles such as freedom of speech and religion, and equality of all groups inhabiting the island are not being upheld by a government that has eliminated presidential term limits and consolidated power into the hands of a few family members. The Tamil American Peace Initiative is concerned that the continued marginalization of Sri Lankans based on ethnicity and religion is paving the way for further conflict. Parts of the north and east which endured the most brutal effects of the war remain restricted to nongovernmental organizations and the press. As the government's rebuilding effort moves forward, many Tamils remain displaced and disenfranchised as Sinhalese being relocated to traditionally Tamil areas are given advantages when it comes to economic, social and political opportunities. According to the State Department’s 2010 International Religious Freedom Report, there were over 20 incidents of violence against religious communities in Sri Lanka since the war came to a close. Although the Sri Lankan government says publicly it endorses religious freedom, in practice, Buddhism is explicitly given the “foremost place” in the country’s Constitution. Despite calls from numerous groups including human rights organizations, members of the free press, and the US State Department for a meaningful investigation into credible allegations of human rights violations and violations of international law committed during the last stages of the war, the Sri Lankan government refuses to do so. It has instead empanelled the Lessons Learnt and Reconciliation Commission (LLRC), a commission that falls well short of what is needed to get to the bottom of the truth, a perquisite for reconciliation in Sri Lanka. The LLRC lacks the mandate to investigate the most brutal stages of the war where the government has been implicated in the deaths of tens of thousands of civilians. Without a complete, impartial investigation into all alleged violations, and accountability for all those found culpable, Sri Lanka’s prospects for lasting peace and meaningful reconciliation are looking bleak. The Tamil American Peace Initiative was formed to address these problems and help bring lasting peace to Sri Lanka.